A few months ago, my friend Patrick told me about something he and Old Man Ballsky (both of whom you may have met, if you've seen some of my other posts) had been planning, the prom vault. 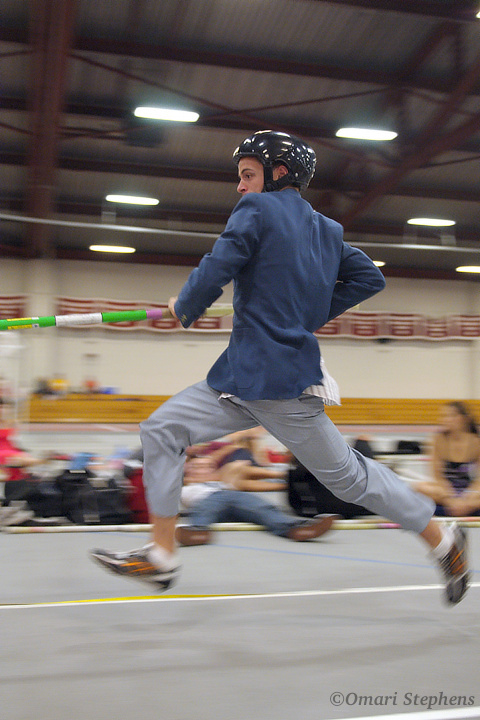 It was like a normal track meet, except only the pole vault would be contested, and only formal attire would be acceptable. I immediately marked my calendar (a lie, since I don't have a calendar) and set to thinking about what sort of outlandish getup I might be crazy enough to vault in. As the months prior to the event counted down to weeks, more details were announced. A prom vault in name alone is not much of a prom vault at all. So to stay true to the theme, you had to have a date to compete. The partners with the greatest sum of heights would win. When the day finally arrived, I was running behind on the tailoring/surgery of my uniform, but was excited to see what other folks had worn. I finished sewing literally minutes before heading over to the gym, where folks were already warming up. 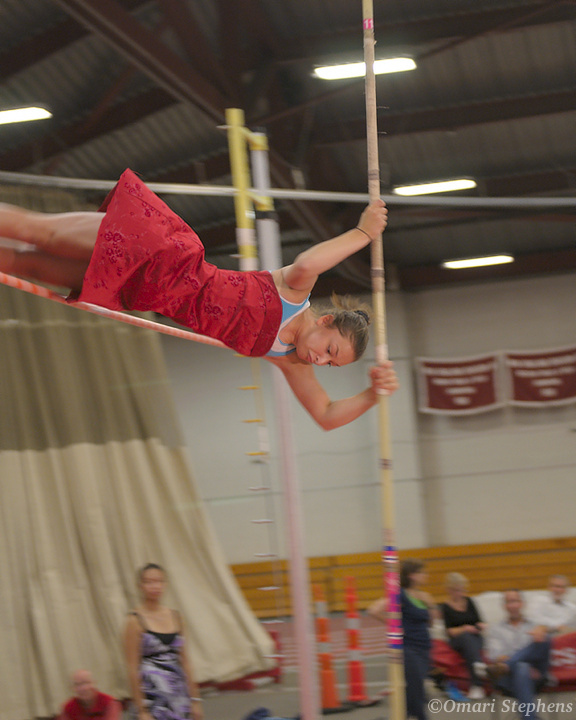 One thing I found so peculiar about the prom vault was that it felt so much like a normal meet. People caught each others' steps, as often happens at a normal meet. And as always, there were poles everywhere, and the vaulters holding them only maintained a loose semblance of a line while waiting for their respective turns on the runway. The only difference was that these vaulters wore dresses and suits and even coattails. Well, perhaps that wasn't the only difference. The brother of one of the vaulters plays in a jazz trio, which showed up and played for a few hours. I really enjoyed the the mix of experiences that one usually finds in totally different environments. It was like an upside-down cake of amazing juxtapositions and contrasts (This sentence was for Patrick). In addition to the myriad forms of entertainment, it was fun to see how each vaulter's attire stood up to the rigors of an actual jump. This dress-turned-much-shorter-dress was the only one that was stiff enough to keep from flopping inside-out during a vault. 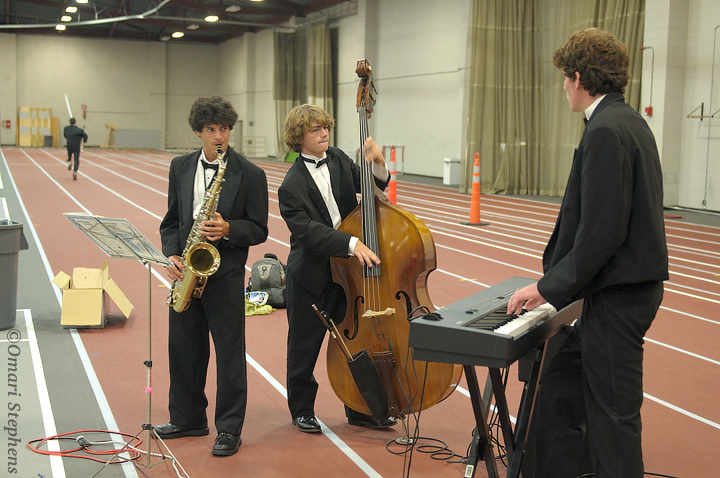 For a short while, the jazz trio took a break and The Ballinator, a jazz musician in his own right, took to the keys. P-man (yes, that's Patrick) had a quick dance with Julia as Sharpé took a seat and demonstrated why these are his go-to pants for flood conditions. Unfortunately, every competition of unparalleled amazing hyperbole must come to an end. Of course, given the circumstances, and with apologies to Dave Eggers, this end could only truly be described as a heartbreaking ending of staggering genius. Or something like that. Anyway, despite somewhat suspiciously breaking a tie for third place in favor of Emily and himself, Patrick ran most of the awards ceremony in a surprisingly efficient and well-organized fashion. Near the end, Old Man Ballsky put P-man in his place (on the podium, next to his date), and finished the awards presentations. 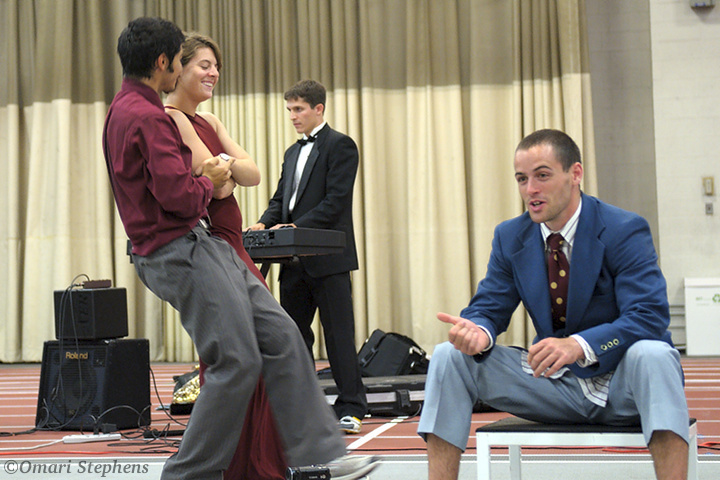 In what was pretty much a foregone conclusion until an also-suspicious last-minute scoring rule swap, Hanna and Alex were crowned queen and king of the 2009 MIT Prom Vault. Congratulations also to second place finishers Jim and Jillena. "Life is not a journey to the grave with the intention of arriving safely in one pretty and well-preserved piece, but to slide across the finish line broadside, thoroughly used up, worn out, leaking oil, and shouting GERONIMO!!!"